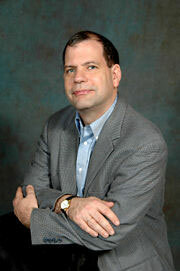 Wabash College will host economist Tyler Cowen to lecture Monday on "The Financial Crisis: What Really Happened." His talk will take place at 8 p.m., February 23, in Lovell Lecture Room (101) in Baxter Hall. Cowen is a Professor of Economics at George Mason University and writes daily at the blog, The Marginal Revolution. Cowen has written several books including Creative Destruction: How Globalization is Changing the World's Cultures and his most recent book, Discover Your Inner Economist: Use Incentives to Fall in Love, Survive Your Next Meeting, and Motivate Your Dentist. Tim Harford from The Financial Times describes his book: "Tyler Cowen is an economist, culture vulture, restaurant critic and the best blogger in the world. All roles are on display in Discover Your Inner Economist. It’s charming, smart and very, very creative. And it will change your life in the best way: in small steps." In addition to his evening lecture, Cowen will give a noon talk on "The Future of Music in a Globalized World" in Baxter Hall, room 101. Cowen’s talk is free and open to the public and is sponsored by the Economics Department and the Rogge Fund.